We bought our new Frigidaire clothes dryer about one month ago, to match and go along with our new Frigidaire washing machine. I love the washing machine, but am not as pleased with the dryer. Frigidaire is an awesome manufacturer, and I highly recommend them. 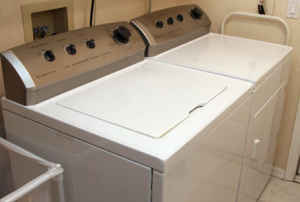 Maybe it is just this particular dryer, but it just does not dry as well as I would like it to. This happens with the larger loads, like a load of towels or jeans. However, that is why I purchased a heavy duty, commercial type dryer rather than a regular one. My partner and I do laborious work at times and that means lots of jeans in the laundry. We also take lots of showers so that means lots of towels. This dryer is not bad, but sometimes it takes two to three times of drying for 40 minutes to get towels done. I have even tried starting out with the longest setting, 70 minutes. That doesn't work, either. So I cannot completely recommend this dryer as one that is heavy duty or commercial. I think it works as well as a regular dryer. The setting are air fluff, knits/delicates (lo heat), colors (medium) and whites (high). There is a drum light which is very nice. I use timed dry exclusively but will try fluff or lighter cycles when I need them. If you have regular laundry that is not terribly special and you need a good dryer, this is a decent choice. I just would not say it is as good as it is reported to be. Use small loads only, and keep it on the high heat setting. We bought this dryer at Home Depot. With today's energy costs, I am certain that a 3 hr period for drying a load of towels is not acceptable. Never again, Frigidaire. I bought a Commercial Heavy Duty Dryer 6 yrs ago. Come to find out my dryer has a manufacturing default. The lint blows out of the air vent in the back and not the exhaust. The dryer has become a fire hazzard. The lint catches in the lint trap like it is suppose to do but does not make out through the exhaust. Instead it some how gets sucked up into the heating element. In order to have this problem fixed it has to be taken totally apart. I have a had the on/off knob break off and the knob for the timer is sticking. After seeing similar complaints I will never by another Frigidaire product! I agree with all of your comments 100%. I have had difficulties with towels and jeans as well. I my opinion it should not take over 2 hours to dry 4 pairs of jeans or 4 bath towels. It seems the hotter setting you use on the dryer, the longer it takes to actually dry.